Leaving Rayleigh to the west, it was a short distance into the countryside to Rawreth. St Nicholas sits broadside on to the village street. The outer gates were hooked back, the inner door was wedged open with a lump of stone. 'Welcome to your church', said the sign on door. 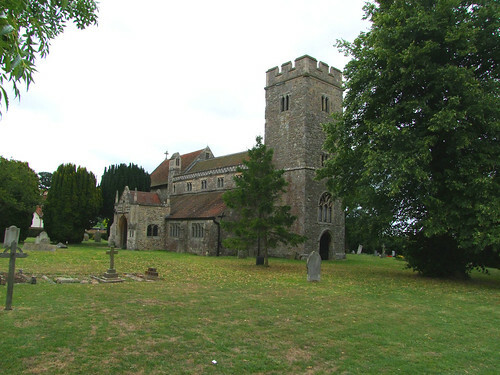 This is an interesting church, because it was substantially rebuilt by Ernest Geldart who we have met before at, among others, Great Totham and Great and Little Braxted. Only the tower and arcade are medieval. Geldart is interesting because he used medieval forms from non-ecclesiastical buildings to create worship spaces for extremely high Anglo-Catholic liturgy. That tradition has gone here now, but the fixtures and fittings survive - just. There was a massive restoration 1986-90 which cost £75,000, but already the south chancel wall is collapsing, and the floor of the sanctuary breaking up, all the tiles coming loose. It is hard to see how they will rescue it. There are murmurings of redundancy, but it simply isn't a significant enough church for the CCT to take it on. Thoughts provoked, we left the narrow band of countryside and, re-entering urban sprawl, came to Wickford.